"You know that place between sleep and awake, the place where you can still remember dreaming? That's where I'll always love you. That's where I'll be waiting." I have been following these fairy directions for a very long time. 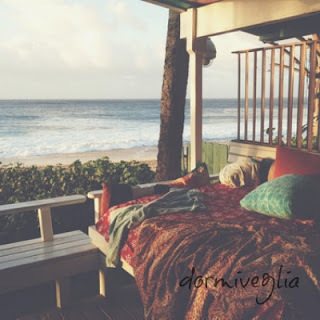 If you can train yourself to maintain a state of relaxed attention in this in-between state, called dormiveglia in Italian, you will notice that you may be receiving a whole menu of possibilities for lucid dream adventures. Images, faces, landscapes rise and fall. When you learn to hold one of them in focus, it may become the portal for a conscious journey. The Parade of Faces is a frequent phenomenon in this state. You may feel you are among a crowd of people, with faces and figures rushing by. Sometimes one may turn to look at you, which can be an interesting opportunity to enter a shared experience with another dream traveler you may or may not know in ordinary reality. Sometimes the images rising and falling before you look like a child's sketches, or cartoons. A frequent sighting for me, in this in-between state, is of what initially looks like the weave of a carpet or the mesh of a net. I have come to recognize this as a kind of border between states of reality and consciousness. With intention, I can part the strands and find myself in another order or reality. The liminal state of hypnagogia, which I often call the Twilight Zone, is a good place to become aware of your ability to travel beyond the body. I often find myself lifting out of the body quite effortlessly in this state, without bumps and grinds. Sometimes, when tired, I simply rest half in, half out, of my physical form. Sometimes I float up to the ceiling. Quite often I go flying, like a bird, over my sleeping city and to places far away. As Tinker Bell counseled, the Place Between Sleep and Awake is, above all, a wonderful place to rendezvous with other beings and other intelligences. It is a state in which we often become away of the psychic activity around us. We may receive visitors, and we will want to learn to screen and discern who we are letting into our space. Often, I find different casts of characters waiting or popping up as I hover on the edge of sleep or linger in the twilight zone of hypnagogia. Sometimes, they appear to be quite literally on stage, or in the wings, waiting for me to show up in order to start or resume a play. 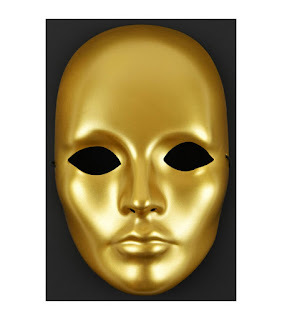 More often, they seem to be characters in life dramas that are being played out in other times or in parallel worlds, dramas in which I have a lead role from which I may have been absent while attending to things in my default reality. The 3rd century philosopher Iamblichus counseled in his treatise On the Mysteries that we should pay special attention to “god-sent experiences” that become available in the “condition between sleeping and waking”. He observed that “when sleep is leaving us, and we are beginning to awake...voices are heard by us” and “sometimes a bright and tranquil light shines forth". I frequently have inner dialogues in the Place Between Sleep and Awake, with sources of knowledge I have come to trust. This is a time when I can often receive streams of counsel and information from inner guides. In Dreamgates, I record some of my conversations with the intelligence I decided to call "G2". He carried the vocabulary and knowledge of a great Western Mystery order. I felt he was a transpersonal figure, though in no way alien to me. Many others have come to me in this liminal state. The most important of these inner guides is certainly no stranger; he is a self who observes and operates on a level of reality above the one I inhabit while living on this Earth in a physical body. In the history of creative breakthroughs in every field, including science and technology, the hypnagogic state has been of vital importance. 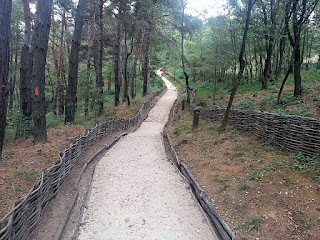 In this liminal zone it is easy to make creative connections, which often involves linking things that seem to the routine mind to be unconnected. 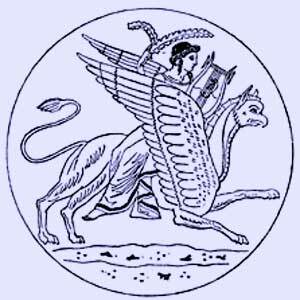 Many inventions and discoveries attributed to dreams by over-hasty writers - like Kekule's discovery of the benzene ring - are actually gifts brought through from hypnagogia, to such an extent that I call this zone of consciousness "the solution state" in The Secret History of Dreaming. The Place Between Sleep and Wake can be the very best place to go on with a dream or go back inside one. You may want to practice dream reentry to clarify information from a dream, or get to its full meaning, or continue a conversation with a dream character. You may need to reenter a dream because there are terrors to be overcome, or a mystery to be explored, or simply because you were having fun and adventure and would like to have more. Or because Tinker Bell is waiting for you. The Place between Sleep and Awake is the best place to develop the continuity of consciousness prized by advanced practitioners of the yoga of sleep and dreams. I am talking about growing your ability to maintain awareness and witness perspective as you move back and forth between sleep, half-sleep, dream, lucid dreaming, what Sri Aurobindo called “the sleep of experiences” and the dream of everyday life. For me, it is less interesting to wake up to the fact that I am dreaming than to be able to observe myself and be fully aware that at every turning in any state of being and consciousness, I have the power to choose what I will do and to test the limits of any reality. To find yourself you must lose yourself. The One you are seeking is not inside you. You are inside the One. you must be here, now. Now is the center of all times. and travel on parallel lines. you must go by a way you do not know. Burn your maps to make beacons. To wake up, you must dream. who could join the ranks of the living dead. dark dwellers at every new threshold. Without them, how could you be ready to pass? and laugh at your creations. you must carry marvels within. A mirror can't show you what you don't bring. you have to drink jungle juice with anacondas. Put your blade away, dragonslayer. and ride it and turn its energy towards Light. Turn out the lights if you want to find the Light. The visible is the skin of the invisible. In the dark, it is easier to see with inner eyes. Don’t list the Trickster among your demons. Everything interesting happens on the boundaries. If you want to be fully alive, be ready to die. of Death on your neck. Give him some foreplay. Name only one God, and you’ll always end up with two. Seek the nameless behind the forest of names. and the rabbit, the lily and the stone. become a stage for divine events. Notice what neverending story is playing through you. Look after your poetic health. Notice what rhymes in a day, and a life. Follow the logic of resemblances. and bring gifts from the Otherworld into this one. stops licking your neck and takes you in his full embrace. Many years ago, I spent a weekend driving around the upper Hudson valley of New York. I was profoundly dissatisfied with my life. From the outside, that life may have looked like a dream fulfilled. I was a bestselling thriller writer; publishers competed to offer me high six-figure advances, laid on stretch limos and made sure the Dom Perignon waiting for me in the hotel suites they paid for was perfectly chilled. And my life felt hollow. I knew I had to make a break with big cities and the fast track I had been on and get back in touch with the spirits of the land and my own deeper creative spirit. On that upstate weekend, a few miles from the village of Chatham NY, a Realtor showed me some land with a run-down farmhouse that might be available. The house would need a ton of work, but as I walked the land, half of it still primal woodlands where the deer drifted in great droves, I knew in my gut this was a place I needed to be. I sat under an old white oak behind the house, feeling the rightness of the place but also that I needed a further sign. A red-tailed hawk circled overhead, dipping lower and lower, screaming urgently at me in a language I felt I ought to be able to understand. I did not speak hawk, but I could not fail to get a message when she proceeded to drop a feather between my legs. That visitation by the hawk was the clincher. I purchased the farm, moved to the country, and soon found myself changing worlds, which is what can happen when we radically change the way we inhabit the world. When we had restored the farmhouse and moved in, I was drifting one night in that in-between state of consciousness the French used to call dorveille, sleep-wake. I found myself gently rising from my dormant body on the bed, in a second body, a dreambody - not an exotic experience for me, as far back as I can remember. 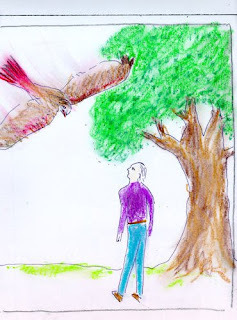 I floated out over the night landscape, and found that in my dreambody, I had wings - the wings of a red-tailed hawk, scaled to my size. I had a marvelous time enjoying a highly sensory experience of flight, riding thermals, swooping and soaring, seeing the world at different angles. I found myself flying north, over Lake George and then Lake Champlain. I noticed the Northway and modern towns were missing from the landscape below me. I felt the tug of someone else's intention, and followed it, out of curiosity, to a cabin in the woods somewhere near Montreal, where I was received by a beautiful, ancient indigenous woman. She spoke to me for a long time in her own language, her words like lake water lapping, while she stroked a beaded belt that hung from her shoulder, with the design of a she-wolf and human figures. I was fascinated, but did not understand a single word, any more than I had understood the language of the hawk. I knew I had been in the presence of a woman of power, and I hoped that, since this felt urgently important, more would be revealed. The design of the belt, in my night vision, proved to be the equivalent of the hawk's feather: a way I could receive and confirm a message even though I lacked a necessary language. My first Iroquois friend - met later through an interesting series of coincidences - was able to show me a wampum belt identical to the one in my vision. It was in the archives of the New York State Museum at that time; since then it has been returned to Onondaga, the traditional capital of the Confederacy of the Six Nations of the Iroquois, or Longhouse People, among whom the Mohawk are Keepers of the Eastern Door. He told me it was believed that the belt was the credentials of an ancient mother of the Wolf Clan of the Mohawk People. I entered deeply into the study of the traditions of the ancient dream shaman who had called me, when I was flying on hawk's wings. This opened to me ways of dreaming and healing that were possibly shared by all our ancestors, but which have become atrophied, when not actively suppressed, in modern society. 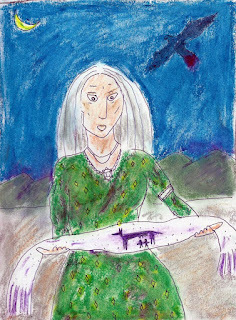 I came to call the ancient shaman Island Woman; this reflects the fact, which I was able to confirm through historical research, that she was captured as a young girl from the Huron/Wendat, called by the Mohawk the Island People, to be raised as Mohawk. In order to receive her teachings fully, I had to study the Mohawk and Huron languages, and reclaim terms from early sacred vocabulary. New dreams eventually called me to leave the land to which the hawk had called me and teach what I had learned about dreaming the soul back home and dreaming for our communities. We sold the farm to a woman who promised to conserve the land. As we were leaving the house, after our final checks, I was inspired to go back inside for no reason I could express. I heard a scuffling in the family room we had built, overlooking the old white oak. I found the noise was coming from the hearth. When I removed the firescreen, I found a young red-tailed hawk - a fledgling - that had somehow managed to fall down the chimney between my last two visits. My last action, on the land I acquired because of the hawk, was to carry the young hawk outside, next to my heart, and release her. She flew straight into the branches of the while oak where the first hawk had delivered her message. The red-tailed hawk has become my most important bringer of omens. A hawk in good shape, flying my way or grabbing a good meal, will give me a surge of confidence for the day that has yet to be disappointed. A dead hawk in power lines will make me batten down the hatches and watch out for challenges. I was once very late for a phone interview with a California journalist who was irritated and pressed for time. I wasn't sure the interview was going to go well. She asked me to give an example of how I navigate by synchronicity. I was standing on the balcony of a villa overlooking Long Island Sound. Right below me, three bunnies had been scampering about in the grass. As I considered my response to the journalist's question, a red-tailed hawk made a vertical ascent, talons outstretched. It grabbed a bunny and shot straight up with its dinner in its clutches. Given my affinity with the hawk, I took this as a good sign, indicating that despite our bumpy start the interview would turn out fine. I was about to recount what had just happened when some inner caution made me pause. I was talking to a journalist for a Californian holistic magazine; for all I knew, she was a vegan who might be horrified by the scene of the hawk taking the bunny rabbit, especially if I reported it with the relish I was feeling. So I told her a black dog story and she loved it and the interview came out just fine. The hawk sign was, once again, reliable. 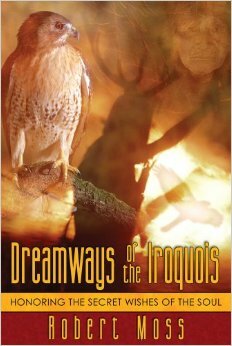 For fuller versions of my encounters with the red-tailed hawk and Island Woman, please see my books Dreamways of the Iroquois and The Boy Who Died and Came Back. “Put off your mask,” she says. you see the false face behind the false face. I do not speak of magicians. or wear the mask too long, it becomes poison. because you have become a ghost of the living. you were given when you were six. your controllers stole from its core. See your bright dreamer awaken in its eyes. in a garden on the dark side of the Moon. and offer forgiveness, the heart of healing. In her dream, a woman comes to the edge of a deep well. She is horrified to discover that a beautiful but very sad young girl is drowning in the depths of the well. She wants to help. To do this, she must lower herself into the well. She loses her grip and falls. Now she is underwater. Her lungs are filling with water, her senses are swirling, she knows that she, too, is drowning. She remembers her intent to rescue the girl. 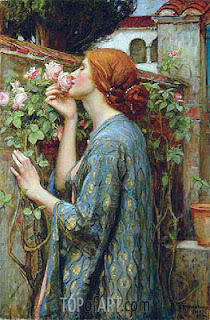 As the will to do this revives in her, she discovers something amazing. She can breathe underwater. She swims to the drowning girl, grabs her, and carries her to the top. She was eager to tell me the dream. "First feelings after waking?" I asked the first question I ask, of any dream. "Is there anything in the dream you recognize in the rest of your life?" "The sadness. I have often felt I am drowning in sadness." "What do you most want to know about this dream?" "I want to know about the well. Why is this happening inside a well?" "If it were my dream," I said, "I would think of the well of memory, and the well of emotions. This well takes me deep into life memories, and emotions that are powerful enough to drown me if I fail to set very clear intentions in taking the plunge. The well is also a portal, a doorway. In my dream of your dream, the young person who is drowning in the well is my own younger self. This dream has given me a way to reach to her, to connect with her and help both of us to move beyond that overwhelming grief and sadness. I feel that I can use this connection to support my younger self in her own time. I also feel that the connection between us will allow me to bring the vital energy, joy and imagination of my younger self into my present life." The dreamer was nodding vigorously. Her face had been creased with worry or anticipation earlier; now a lovely smile flowered in her features. "Such a dream requires action," I went on. "I would do two essential things to honor the dream and to use the doorway that has opened between me and my younger self. First, whenever I find myself thinking about sad things that may have happened early in life, I would consciously project thoughts of encouragement to my younger self in her own time. For example, I can tell her, You'll survive. You'll make it through. I promise you this. I believe that you really can reach your younger self, in this way, folding time. In doing it, though, you must remember not to succumb to the raw emotions of that earlier time. Your mission is to be the rescuer, as you were in your dream." More eager nods and smiles. "Next, if this were my dream, I would want to be sure to do things in my present life that my younger self would enjoy. Eat something she likes. Play a game she enjoys. Go to a place she loves. I would want to encourage the child part of me to see that I am fun and I am safe, so that we can enjoy a creative life together in the present time." The dreamer eagerly agreed to follow both these suggested plans. As her features continued to soften and brighten, I felt sure that she had drawn her beautiful girl self back into her energy field. This sense was confirmed by the brightness of spirit in her eyes. I noted that in English there is another meaning for the word "well", as in wellness. Any night, and day,we may go fishing for soul in the dream well. It's hard to keep track of him. When I come home from our travels, I am not quite myself and no longer him. When we part company, I am left to pore over scraps of memory like the things I find in my pockets and on my phone after a regular plane trip: a boarding pass, a bus ticket, a foreign banknote, a scribbled love note, random photos of far-away cities and beaches and train stations. I am talking about the Traveler, the self who is not confined to my body or brain in dreams and journeys. I track the Traveler by recording his exploits – the ones I manage to catch – in my journal. In one report he seems to be very like my present self, just two days ahead of me, on my present probable event track. Sometimes he is much further ahead, or on a different – mildly or radically – event track, or he is in another body in another time or another world. Sightings by others give me clues to the range of his excursions. On any given day, it is not unusual for me to receive 20 quite specific reports over the internet from people who say the dreamed of me, in addition to dreams of me shared in person by members of my workshops. My default response is to suggest that the dreamer might want to ask what part of them resembles Dream Robert in some way (for example, as dreamer, teacher, writer, traveler, large person with white hair). Yet I also know that dreaming is social as well as individual, transpersonal as well as personal, and I am aware that the Traveler leads adventures in the dream lands as well as in the physical world. 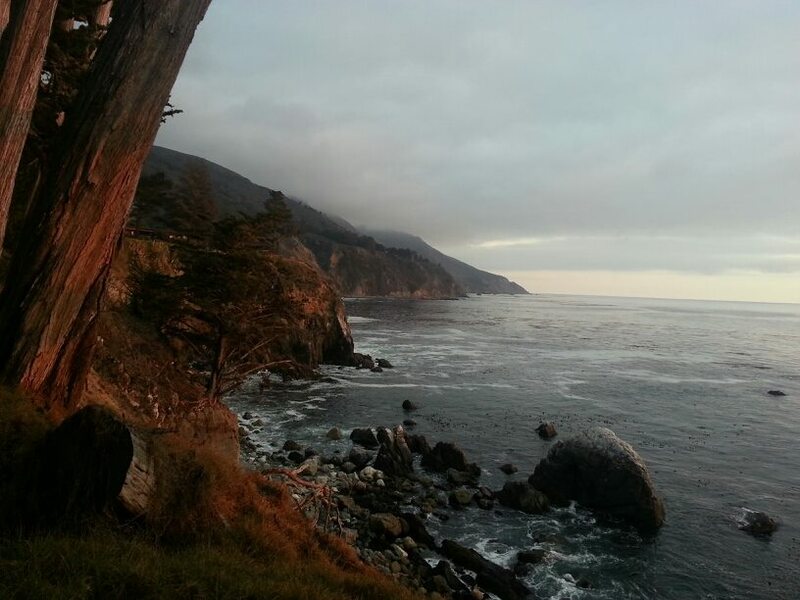 Some weeks after leading one of my 5-day adventures at the Esalen Institute, I received a note from one of the participants, a highly intelligent, spirited lady, a person with two PhDs who had explored consciousness in many ways. "I want to thank you for that wonderful lecture you gave last night." I checked the date. I had not given a lecture that evening anywhere in consensus reality. I had already intuited what she was telling me. She had attended a lecture I gave in one of her dreams. The woman from Esalen reported that in my lecture, I had listed, "very clearly and elegantly", five reasons why we misinterpret dreams about the future. I had written them on a whiteboard in view of the group. This gave me shivers. On that very day, I was laboring over a chapter in a book that was later published as Dreaming True. The chapter was titled "When Dreams Seem False" and on the first page I was developing a list of the five most common reasons why we misinterpret dream messages about the future. I was satisfied with my statement about the first reason we get these messages wrong. But I was not yet content with my formulation of the other four reasons, or the order in which they should appear on the page. I emailed the woman from Esalen. I asked her, "Any chance you kept notes from my lecture, or could reconstruct what I wrote on the whiteboard?" 1. We mistake a literal event for a symbolic one, or vice versa. 2. We misidentify people and places. 3. We fail to figure out how far in the future the dreamed event might be. 4. We see future events from a certain angle, that may not reveal the whole picture. 5. We confuse realities, confounding a dream that relates to external reality with dreams that are real experiences in other orders of reality. I often play the role of teacher in my own dreams, with many different audiences: with people I recognize, with people I will meet in the future, with people in countries I have not yet visited, with people in other orders of reality, including the afterlife. I have preserved hundreds of reports from people who say they have attended a workshop, a lecture, a ritual or some other type of training with me in dreams. I have learned to pay close attention to reports about Dream Robert's teaching activities, because sometimes I find that he is more than a few steps ahead of me. It's a rare student of mine who brings detailed notes back from the dreaming, but I am open to more. So if the Traveler says something interesting in your dreams, leads a new ritual or demonstrates a new exercise, please send me detailed notes. He is often a few steps ahead of me, as in the case of his lecture about why we miss dream messages. Let me hasten to add that if you dream of me and enjoy the experience, I am happy to accept the credit; if the experience wasn’t great, don’t blame it on me! 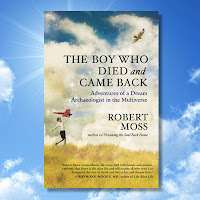 Text adapted from The Boy Who Died and Came Back: Adventures of a Dream Archaeologist in the Multiverse by Robert Moss. Published by New World Library.